Trouble broke out on the Oldpark Road on Sunday afternoon. It followed after those taking part in the parade were prevented from entering the city centre by police. Water canon was used as bricks, missiles and petrol bombs were thrown at police. The anti-internment march was granted permission by the Parades Commission to pass through the city before 1.30pm. However organisers vowed to begin their parade in Ardoyne in the north of the city an hour later. When it became clear to police the determination was not being adhered to, commanders said they would stop the parade from passing through the city. The parade was stopped at the corner of the Oldpark Road and Rosapenna Street. The parade marks the introduction of internment without trial by the Stormont administration, with the support of the UK Government, during the height of the Troubles in August 1971. The controversial policy of detaining suspects (mainly innocent Catholics, many of whom were tortured and some died from that torture) without trial ended in 1975. However, the parade organisers - the Anti-Internment League - allege it is still effectively operated by the state authorities in the present day. 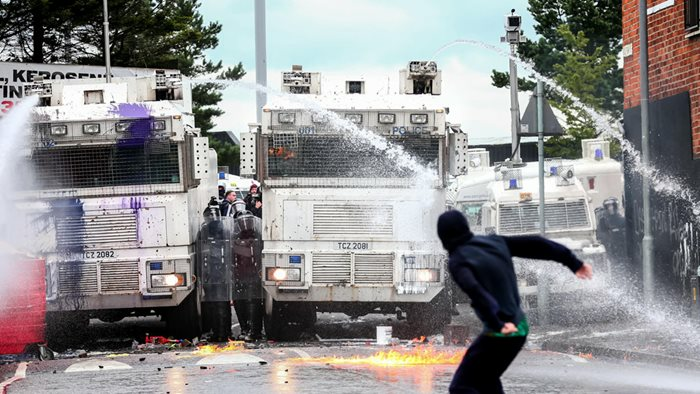 Last year there were minor disturbances at the event but in 2013 almost 60 police officers were injured when loyalist protesters rioted in the city centre. In its application to the Parades Commission, the group said it anticipated around 5,000 supporters for this year's parade.